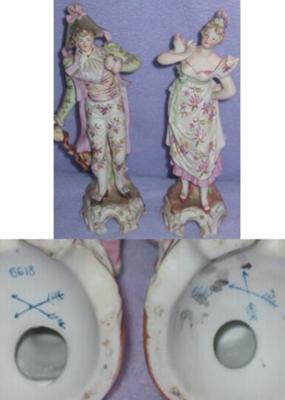 Period Figurines Crossed Arrows Pottery Mark:- I have these two Victorian Bisque Figurines. One woman and one man. They have on clothes with flowers on them and man has a triangle hat leaning on a cane. They both have 2 blue crossed arrows with four feather like things on end and 6618. I will send another picture after this one so you can see whole figurines. Thanks for any help with identifying them. Many thanks for your interesting photos. It is always important to have good visuals to help with identification - none more so that this case. This particular mark is a target for with fakery, particularly from a New York based importer from Japan called Arnart or Homco. They are imitating the mark of quality German makers called 'Kalk' Porcelain of Eisenberg in Thuringia (1900 - 1973), formerly Geyer & Körbitz (1890 - 1900). If you look more closely, the figurines in the picture don't seem to have the quality associated with genuine Kalk - a maker that prided itself on quality of sculpt and make. For example, look at the heads. The heads do not match the body. They are children's heads on adults bodies. Bazaar really. Let's just say, you would be hard pressed to find a genuine Kalk, as there is a proliferation on the fakes around. If you saw a real one you would probably spot the difference immediately. Be on the look out for these poor reproductions. Thank you for this information! I was at an auction and was intending to bid on a pair of bisque figurines that look exactly like the figurines in your photos. This pair have the crossed arrows mark with 4 feathers also.I got stuck with a porcelain lidded handled butlers dish that had the same crossed arrows. Fortunatly, I remembered that event in time and avoided getting cheated again. Caveat Emptor! Many thanks for your feedback - it makes it all worthwhile to think this website helped you not be diddled. As I say, I am not an expert in what is or what isn't a fake Kalk, I am just reporting that there are said to be many 20th Century Japanese figurines bearing the crossed arrow pottery mark of Kalk. If I saw something with a Kalk mark that I was looking to bid on, what I would do is look for the quality (or lack of it) in the sculpting and decoration. The devil is in the detail. For example, I would look at how the sculptor understood folds on fabric and took care to reproduce this authentically - this is always a give-away as to quality. Put a mass produced Far East job against something of quality (and something made over 100 years ago in Germany would almost certainly have quality - whereas something made in the Far East post war almost certainly would not) you would immediately see the difference - it would shout at you, saying "I am quality, made in an era when I had time to be loved and there were the skills to love me". Whereas post war 20th century Japanese ware would be saying "I am an item made on a production line as fast as possible and now we are in the modern world, no one has time or the skills to love me, I am just a product to generate export dollars". I ALSO HAVE A PAIR OF CROSSED ARROWS FIGURINES.THEIR IS ALSO A NAME OF BOLZAT ON THE BASE.ARE THESE ALSO FAKES.I CANT FIND ANY INFO ON BOLZAT. I have two beautifully done figurines. Boy and girl, with aprons filled with fruit or vegetables. They are fairly heavy and are children. They each have blue crossed arrows and the number 7400 on the bottom. Done in pastels with gold accents. Can u tell me anything? Beware Kalk fakes by Far East Importer Arnart. We have written a lot about them here - just use the in-house search box top right to research. The numbers are the give away. I have the same boy and girl with fruit. Are they real? Hello, I have a tea set with the blue arrows stamped with no numbers underneath and no other markings. Nothing appears to have been worn off either. Fake? I cannot find anything on demitasse cups or tea sets online. Thank you for your help! I have a man, woman and child that appear to be peasants-- all barefoot, next to a fancy urn-type thing. Very delicate with gold accents here and there on the base and the clothing of the figures.Lots of tiny flowers. Pastel coloring and the crossed arrow mark on the bottom -- number there, too -- 7586. I'd like to add a photo, but don't see where to do that. Would like to sell it since I'm not crazy about it, but no idea what to ask. Thanks for any clues. What would 2 black arrows with 4 straight feathers in each side? I have two figurines , a boy and a girl both sitting girl is holding a doll boy is holding flowers. They are both marked with the crossed arrows and the numbers 441520. are on the bottom of both. are they true Kalk or are they fakes? I have a double piggy bank....a smaller piggy on the back of the larger one. The marking on the bottom has 2 crossed arrows pointing downward and the numbers 33/ 115. Do you have any info on this? The painting is a blue rose with tan leaved with black veining..looking almost with the impressionistic effect. ive had this elephant since i was a young child of about 7 . im 67 years old. it has the two crossed arrows with the number 792 or 7920 not sure. is it worth anything. chinese japanese roman american ??? I also have a set of lamps with the same marking, and the #7905. They came from my Grandmothers house, so I assume they are actually old. But if their fake yet old are they considered to have no value? Can you show us what the true 'Kalk' marking looks like? Trinket Box on 4 legs. Hello there, I recently found a pretty trinket box at the GOODWILL. It has 4 cabriole-style legs andis decorated on top with flowers and leaves lots of gold coloured crosses and a golden garland around the flowers and leaves. On the base are 2 blue arrow marks with feathers on the one end. It says:-44/142. It was a good price and I fell in love with it. The clasp is also golden and goes all around the box. The fastener is a bit worn, but it does fasten.